The Menominee Indian tribe is a federally recognized Native American group having about 8700 members at present. They had risen to prominence with the historic case against the United States government when the tribe was terminated, also putting their hunting and fishing rights at stake. After a long battle, they got back all their rights and at present occupy a major part of Wisconsin, their original homeland. 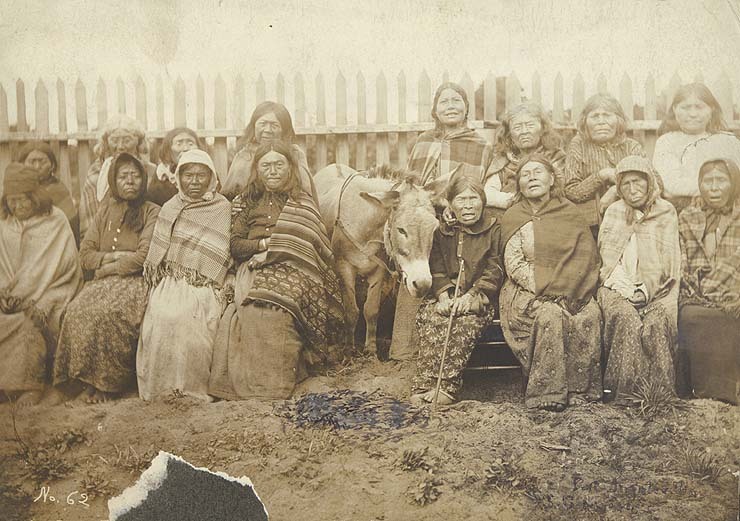 The traditional dialect of these people is Menominee, which is said to be a language of Algonquian origin. With modernization, this language has been highly endangered and according to the Menominee Historic Preservation Office report in 1997, it was the first language of just 39 people and second language of a meager 26 people, while 65 others got acquainted with this dialect to understand it or teach it to others. In an incident a seventh grader was subjected to punishment after speaking in Menominee in her classroom. Later the Catholic Diocese of Green Bay apologized to her for the same. In the Ojibwe language they were called manoominii, meaning “wild rice people”, since wild rice was considered as their staple food. The symbol on their flag bears a circular seal of their nation against a white background. It bears a red thunderbird whose tail is split by a white arrow pointing upwards, signifying the bright future awaiting the tribe. The Menominee is an ancient tribe which occupied more than 10 million acres in the belt encompassing the Michigan-Wisconsin regions. Information obtained from oral history states the people of the Old Copper Culture and other indigenous tribes that dwelt in the Wisconsin belt for over 10,000 years may have been the forefathers of the Menominee. 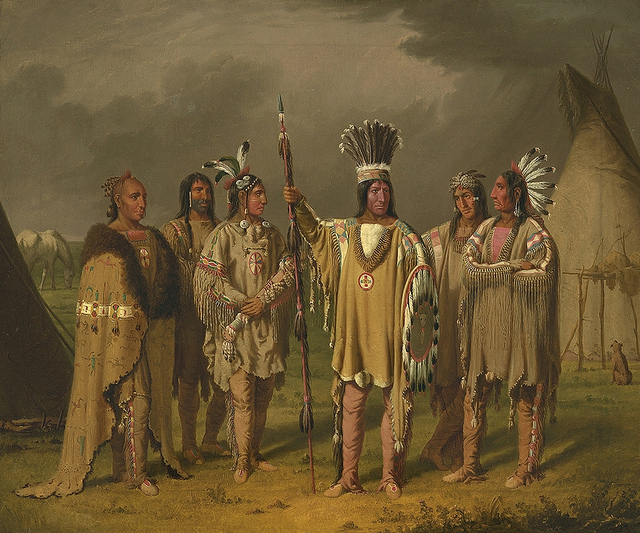 This tribe was known to be peaceful and hospitable, having a good camaraderie with other races, also noted to have shared their portion of water and forest when the Oneota culture emerged in the Southern Wisconsin belt from AD 800 to 900. In the second half of the 17th century during colonial rule, they came in contact with the Europeans, and the French often visited their village for fur trading. 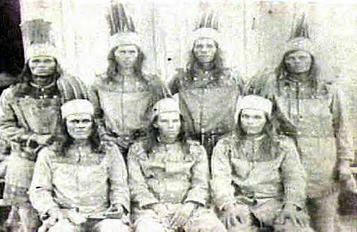 According to a 1928 estimation made by James Mooney, an anthropologist, this tribe had 3000 members in 1650. In the War of 1812, they allied with the Canadians and British helping them in defeating the American forces. They were approached by the Stockbridge-Munsee Indians to cede or share some parts of their land with them for use. Eventually, they sold a significant portion of their properties located in Wisconsin and Michigan to the government of the United States through 7 treaties signed between 1821 and 1848. As mentioned earlier they were subjected to termination in 1961, though their federal recognition was regained in 1973. In the recent times, the tribe occupies the communities of Keshena (1262 people), Legend Lake (1565), Neopit (690), Middle Village (281), and Zoar (98). Wild rice, their staple food, was regarded by them as God’s gift. After the rice was prepared to be harvested, the chief prayed for pleasant weather for four days so that the people could gather the rice well during this span. Early in the morning, the menfolk along with a woman set out in their canoes to knock down the rice stalks and gather them. With time the strategy changed and instead of a male-female pair, groups of men or women often work as a team. Menstruating women or those who had lost their kith and kin in the previous year or recent times were not permitted into the rice field. Apart from rice they even grew crops like beans, corn and squash, gathered berries and nuts as well as tapped trees for extracting maple syrup which was extensively used during special ceremonies and feasts. It was also used to season cereals, fish, fruits and vegetables. The roles were divided between both the sexes as the males took up the occupation of hunting (deer) and fishing, manufacturing canoes and weapons of hunting as well as being involved in warfare. The female folk on the other hand indulged in cooking, looking after their children, gathering firewood, collecting wild fruits, weaving bags and mats as well as making utensils and pottery. Bows, arrows, stone axes and clubs were used by the warriors and hunters, while nets and spears were the tools of the fishing folk. The Menominee tribe lived in summer and winter houses. During the hotter months, they dwelt in rectangular huts made with bark over a framework of a pole. In the colder season their habitation comprised of dome-shaped wigwam made from reed mats and cattail placed over the bent saplings. 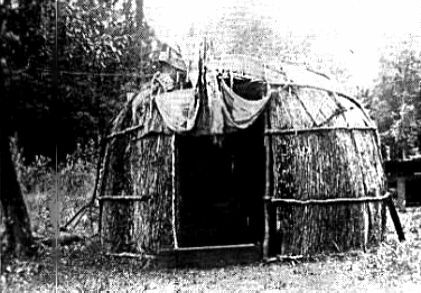 This tribe also had sweat lodges (pole framework formed the base) covered with cloth or bark for performing ceremonies as well as keeping women in seclusion when needed. The menfolk wore breechcloths teamed with leggings, while deer moccasins were opted as a choice of footwear. 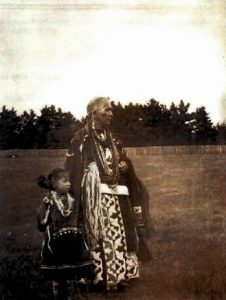 The women, on the other hand, were clad in woven skirts, shirts, leggings and also moccasins. Splayed headdresses were only worn by people holding an important positiond. Fur caps and peaked hoods were more popular among them. 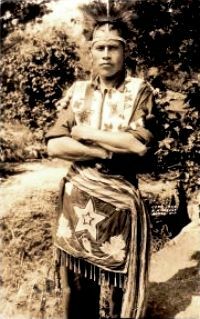 Their dresses were decorated with porcupine quill and satin ribbon arranged in different geometric patterns. At present they have adapted to European customs and mostly wear modern outfits, though their traditional attire is reserved for special occasions. While the women had long hair, the men wore a Mohawk hairstyle, shaving both sides of their head and keeping longer strands of hair in the center. Men and women painted their faces and sometimes also their skin in different colors especially before special occasions. 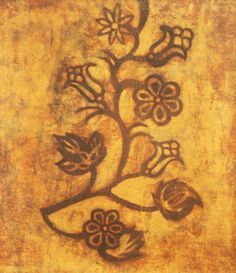 In fact, the patterns of the paint differed in accordance to the occasion like warfare, festival, or religious ceremony. Both the genders wore jewelry mostly made from copper. Their primary mode of transportation was canoes made from hollowed-out logs as well as birch bark. Canoeing is still popular though the tribal people no longer make their boats. While traveling on land, dogs were used as pack animals, and during the winter months, sleds served as their primary mode of transportation. In the present times, they are known to resort to modern modes of communication like the car. Some of their prominent work of art included pottery, quilling, and floral beadwork most of which were done by women. The also made wampum (small cylindrical beads) using white and purple shell . 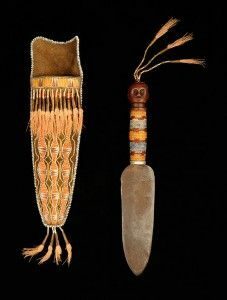 In the ancient times, they mostly traded with fur with the French colonialist, which was gradually replaced with canoes, weapons as their civilization progressed. The wampum beads were used as a currency for a transaction. 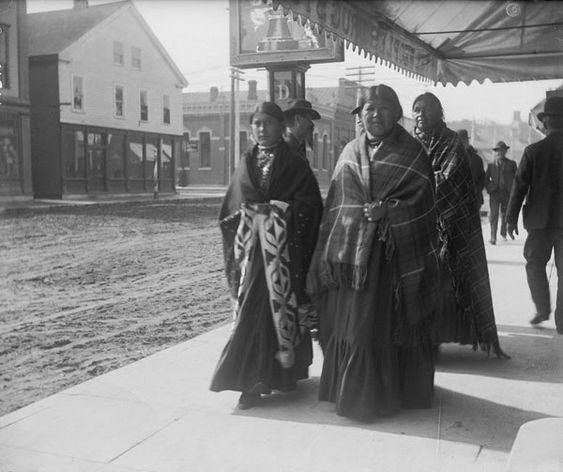 The Menominee tribe followed a dualistic religion, believing in the existence of good and evil spirits in the upper and lower world respectively. The Mecawetok was considered as their supreme deity below whom reigned the thunderers, and morning star. Among the evil powers were the Great White Bear, white deer, horned hairy serpent and underground panther. Diviners or medicine men were known to possess special powers from guardian spirits and were entrusted upon the task of performing religious ceremonies. The Menominees also use dream revelation as a way of being connected to the guardian spirit for the purpose of gaining power. During the rite of passage, boys and girls who are to attain puberty lived in isolation in wigwams, also observing fast for about ten days. The Menominees had a system of patrilineal kinship where children were said to belong to and derive their social status from their father’s clan. Thus marriage could not be solemnized between members of the same patriarchal family. After death, the Menominees would place the deceased on the scaffold or bury them on the ground beneath logs. The goods of the dead like their tools, weapons or ornaments also went along with them in their grave. Certain observers had reported that these people painted the corpse’s body in red as it signified that the soul was privileged enough to be liberated from mortal life and be transcended to the other world. Presently a coffin is used for burial which is placed beneath a structure in the form of a house that also contains an opening for food as well as other offering to be placed. 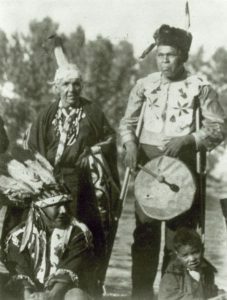 Many ceremonial organizations of the Menominee developed after their contact with the Europeans some of them being the Medicine Lodge Society (that intended to ensure good health and a long life of the members), Drum Dance or Dream Dance society (that pleaded for help to the spirits for their day-to-day activities), as well as the Warrior Dance Society. The pow wow event is also organized by the Menominee every year with pomp and valor. Presently the tribe functions in accordance with its written constitution, also electing a tribal president and council. 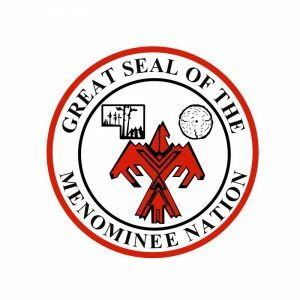 The College of Menominee nation which developed in 1993, has its main campus at Keshena in Wisconsin. Since 1987 June this tribe has started its own gaming casino which has a hotel, also associating itself with the game bingo. Menominees have also made their mark in several fields with some of the prominent members being Apesanahkwat (actor), Chrystos (poet), and Chief Oshkosh (Menominee chief).